President Jakaya Kikwete of Tanzania led thousands of mourners who attended the funeral of Bishop Dr. Thomas Laiser of the Arusha based North Central Diocese of the Evangelical Lutheran Church in Tanzania (ELCT) who was buried on 15th February this year. 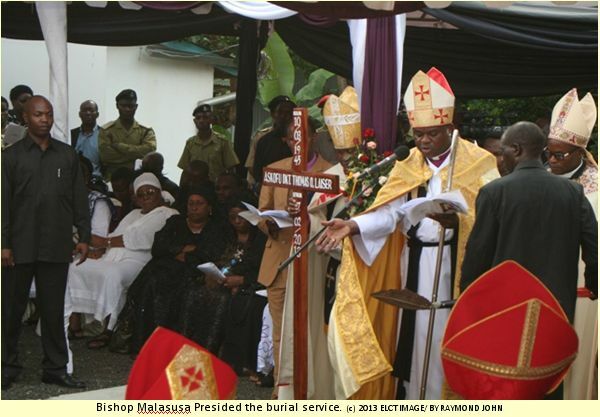 The ELCT Presiding Bishop Dr. Alex Malasusa who led the burial service at the Arusha Mjini Kati Lutheran Cathedral said the late Bishop Laiser was a faithful ambassador and witness of Jesus Christ who worked tirelessly to make sure the Gospel was spread to reach all the people. He said he was diligent and whenever he realised what he stood for a Christ-centred call, he soldiered on without wavering or retreat. He said the sheer number of those who turned out for the burial service showed how much they loved him but God had greater love for him. He said his death should remind all those in attendance to prepare for the day when they will follow suit. However the question should be how are we going to meet our death? Is God the Almighty going to invite us saying welcome my child for your clothes are washed in the blood of the lamb. President Kikwete who led a large number of the ruling party and Government officials including ministers and the Tanzanian Ambassador to Kenya, Hon. Batilda Buriani, expressed profound grief following the death of Laiser whom he described was a diligent and faithful spiritual leader. He also said in his lifetime the late Bishop made a substantial contribution in the improvement of social welfare to the community at large and for that matter he will always be remembered by his church and the community. He said Bishop Laiser loved the people and his messages when he preached was always on the importance of peace, unity and solidarity irrespective of differences in race, tribal, religious or political backgrounds. And in order to honour him, he urged people to avoid making utterances that aim at sowing seeds of hatred in the society. He said people in this peaceful nation should avoid discordant acts or action that may lead to bickering along religious, tribal or political inclinations to the extent of killing one another, He said. People from all walks of life from outside and inside the country attended the funeral that started with the paying of last respect a day before the funeral. The Director of Mission and Development Rev. Dr. Musa Panti Filibus speaking on behalf of the Geneva-based Lutheran World Federation said he joined the members of the congregation in mourning Bishop Laiser who was a dilgent and trustworthy servant. He quoted Revelation 14: 13. The Archi-Bishop of the Anglican Chuch in Tanzania Bishop Valentine Mokiwa spoke on behalf of the All Africa Conference of Churches and the Anglican Church globally. He said Laiser was our Bishop and he was brave. Whenever he spoke he was not a hipocrite. He said the late Bishop Laiser was an advocate who defended the poor. He read Job 19: 25 as message to console the mourners. Speaking on behalf of the Tanzania Episcopal Conference the Archi-Bishop of the Arusha Diocese Josephat Lebulu consoled all those that have been touched by the loss of Bishop Laiser with the passage from John 6: 36 -37. He said the bishop was always sowing seeds that gave birth to solidarity and always came up with solutions to destroy oppressive elements. He quoted Jeramiah Yeremia 1: 10. The Chairman of the Christian Council of Tanzania Bishop Peter Kitula described Laiser as a brave, prohetic and diligent leader, who made a considerable contribution in the Church and the society at large. He urged people to believe in the word in order to see the kingdom of God. He said we lost him at a time his prophetic voice was needed especially now that there were signs of disintegration of peace, solidarity, peace and national unity. Others who read their messages of condolences were Bishop Dr. Gary M. Wollersheim from the North Illinois a partner Synod of the Evangelical Lutheran Church in America and the Director of Leipzig Mission Rev. Tobias Krueger who came to Arusha specifically to attend the funeral. Bishop Wollersheim said he came to know Laiser when he was in Illinois in 1988 for Bishop Wollersheims consceration. He described him as his spiritual leader and whenever he faced challenges he remembered what the late bishop taught him. He read a passage from Joshua 1: 9.